Note : The release was recorded at Tokyo's Duo Club on March 30 this year: their first-ever Japanese show. Mexican acoustic rock duo Rodrigo y Gabriela will release a new live album - 'Live In Japan' - with a bonus live DVD in October. The album captures Rod & Gab making their live Japanese debut, at Tokyo's Duo club on March 30th this year. The show had been sold out for weeks; such was the level of anticipation from their Far East fanbase. 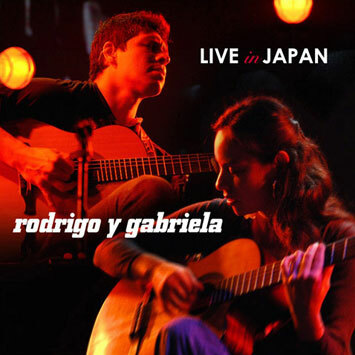 'Live In Japan' mixes tracks from Rodrigo y Gabriela's half a million selling, self-titled third album with older live favourites, and also includes a new track - 'OK Tokyo' as well as Rod & Gab's legendary solo jams recorded for the first time. The album is being released as a limited edition by Rubyworks so their fans do not have to shell out for high price Japanese imports. The album package also includes a five track bonus DVD of highlights from the concert, mixed in 5:1 surround sound; which is sure to be in demand with Rodrigo y Gabriela's fret-fanatic following. Since its release in Ireland in February 2006, 'Rodrigo y Gabriela' has been one of the great word-of-mouth success stories in recent music history. With over 500,000 albums sold worldwide, it has helped to establish Rod & Gab has one of the most exciting live bands on the planet. The duo are currently writing songs for their next studio album at their base in Ixtapa, Mexico. Rodrigo y Gabriela - 'Live In Japan' will be released on Rubyworks on October 17th (Ireland) and October 20th (UK) on CD+DVD and download.